Slaughtneil's Cormac O'Doherty proved Derry's last minute hero with an injury time '65' which took the Oak Leafers to a Christy Ring Cup semi-final at the expense of Down. A converted ’65 by free-taker Cormac O’Doherty, in the fifth and final minute of injury time, dramatically confirmed Derry’s progression to the Christy Ring semi-finals at the expense of beaten side Down. With London pulverising Armagh elsewhere and assuring their own passage through to the semis, it left Derry needing a seven point win over Down, who topped Group 2 before throw-in, to progress. And it would be O’Doherty, who ended with figures of 1-17, who would be the Oakleaf hero at the very death. “I was trying to persuade the boys all week to win this we’d have to go to the wire because Down weren’t going to hand us anything handy," revealed Derry manager Collie McGurk. “We could have made it a bit easier on ourselves if Gerald (Bradley) had buried the goal chance we had in the first half. Down had two inside forwards who could really cause damage. Daithi Sands is a real class act and he was causing us difficulties. Derry dominated possession in the first half, but dogged Down refused to let their hosts get away and were much more economical in front of the sticks. The home side led 0-16 to 1-11 at the break, with Daithi Sands scoring the Down goal soon after Derry had racked up an early lead. For Derry, O’Doherty, returning from a hamstring injury, amassed 0-9 in the opening 35 minutes. Down had the better restart and pulled level at 0-17 to 1-14 after Paul Sheehan’s 40th minute point. Indeed when Daithi Sands hit his second goal in the 47th minute it handed the Ardsmen the lead for the first time in the game at 2-16 to 0-20. After that however, Down would score only three points. Derry, by contrast, finished with a game-winning flurry hitting 1-9, including Meehaul McGrath’s 69th minute goal and O’Doherty’s dramatic late ’65. The calculator is always the cruellest way to decide counties destinies, and this was Down’s day to suffer. Derry, dramatically, march on. “We need to build on this. We’ll be hoping to have Brendan Roger out with us next time. The fellows are playing football obviously against Kildare and we’ve asked Croke Park for an allowance to play the day after." McGurk was full of praise for his match winner and also to Ruairi Convery who made a surprise return to the Oak Leaf jersey as a stand-in goal keeper for the injured Michael Kirkpatrick. “Ruairi's experienced. He’s a good hand. I had hoped to get Micky Kirk back out but he has a ripped groin. I’ll maybe have a chat with Ruairi and see if he’ll show for us again. 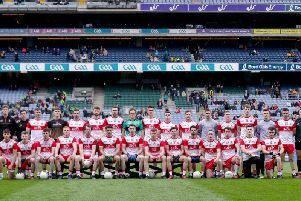 Derry: Ruairi Convery , Sean Cassidy, Niall Farren, Paul Cleary, Cormac McKenna, Eamon McGill, Cian Waldron, Mark McGuigan, Christopher McKaigue, Meehaul McGrath, Gerald Bradley, Naoise Waldron, Cormac O’Doherty, Se McGuigan, Brian Cassidy. Down: Stephen Keith, Brook Byers, Peter McManus, Michael Hughes, Mark Fisher, Ruairi McCrickard, Liam Savage, Declan McManus, Rian Branagan, Pearse Og McCrickard, Caolan Bailie, Paul Sheehan, Daithi Sands, Danny Toner, Eoghan Sands.